My heart broke last week when – as temperatures dropped – I had to empty three full rain barrels. It seemed sinful, somehow. A long section of hose on the spigot, backed up by a watering can, let me spot water the garden as they emptied. But some water simply had to run down the driveway. The value of rain barrels depends so much on when the rain comes – or if. Empty rain barrels can’t water a garden. As I wrote earlier this month, we often had half our usual precipitation in 2015. While techniques like mulching can conserve water, when there’s no rain you need backup. So I’m thankful I have Mr. TG, who loves solving problems. A few years ago, he rigged me up an easy-to-use watering system, the backbone of which is the two-spigot tap above from Lee Valley. I’m inclined to agree with their catalog when they call it the “best shut-off valves ever.” Trust me on this, we got them using real cash money (and have invested in more since), and I say “I love you” every time I use them. Much easier than those wee wedge turn-offs, these levers have leverage! 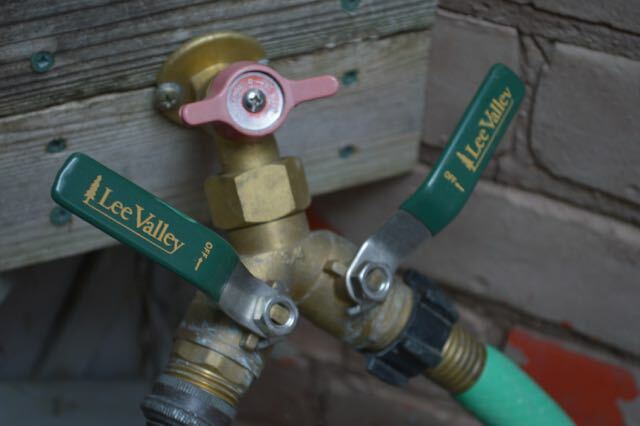 The main shut-off valve (the one that once was red) is a smaller version of the same type of ball-valve system Lee Valley uses – a quarter-turn tap from Aqua-Dynamics (purchased from Rona or Home Depot), which fits better into the tight space at the top. One side of the Y goes to a soaker hose and gets turned on in emergencies. The other side waters my vegetable containers. Over 2015’s hot, dry July, that became pretty much daily. I’ll be writing about more of my watering favourites later. Meanwhile, I’d love to hear what you do in your garden when your rain barrels are empty. drain the water that is left onto the shrubs . Douglas, I have actually done that, too. 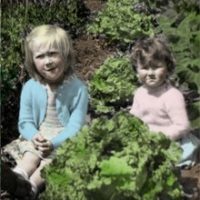 There was a time when Toronto's water had an off taste and smell a few years ago (if you remember that), and we purchased large jugs of water to tide us over. I reused those jugs quite a few times, filling them with rain barrel water for my winter watering. But the jugs eventually wore out, and I haven't done it since. Perhaps it's time for me to reinvest in some kind of replacement. My dream, of course, is a large underground greywater and/or rainwater reservoir, when I win the lottery. Hey…that valve is on my list for next year (along with all around drip irrigation in the veg beds)! 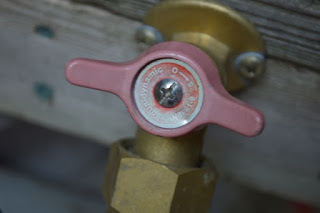 I'll be adding a portable spigot to 3 garden areas & I HATE those valves from the home improvement centers with the tiny knobs – I can never seem to turn them and have to resort to having a set of plyers around to do just that. You whisper sweet nothings to your faucet while I curse at mine – but next year, no more! We have portable spigots in the front garden, Margaret, using the same shut-offs. And I agree with you totally about those tiny knobs. (BTW, there are tiny knobs on two of the rain barrels, too. Hmmmm.) I hope you get your dream system next year!